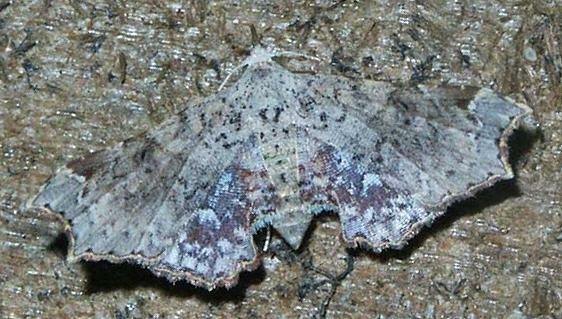 The adult moth has brown or grey wings with a vague white-edged dark triangle on the costa near the wingtip, and often some other vague dark markings, on each forewing. The hindwings are decorated with areas of pale blue markings. Each wing margin is ragged, and doubly recurved, with a cusp near the middle. The hindwings each have a concave tornus. The wingspan is about 2 cms. Volume 32 (1908), p. 79.